Whenever I come across inspirational stories, it moves me to give Almighty God even more praise. 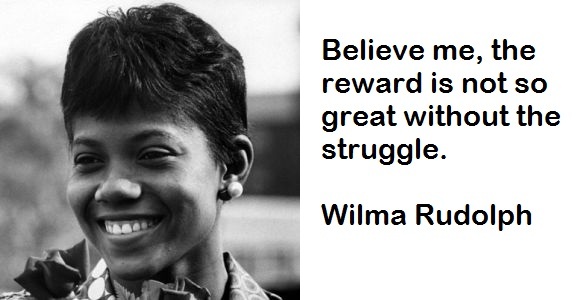 The story of Wilma Rudolph is one of unshakable faith, triumph over trials, hard work, tenacity, persistence and the hand of God. On June 23rd 1940 a little girl was born. She was the 20th of 22 children! She was born prematurely and weighed only 4.5 pounds but she and her mother were not permitted to be cared for at the local hospital which, in the sadly segregated southern United States, was for whites only. She was black and her name was Wilma. There was only one black doctor where she lived, and money was tight, so Wilma’s mother spent the next several years nursing her through one illness after another: measles, mumps, scarlet fever, chicken pox and double pneumonia. Then it was discovered that her left leg and foot were becoming weak and deformed. She had contracted infantile paralysis (caused by the polio virus) at age four. The doctor said that Wilma would never walk. But even though it was 50 miles away, her mother took Wilma to a special hospital twice a week for two years, until she was able to walk with the aid of a metal leg brace. On her twelfth birthday Wilma said to her parents, “I have a birthday surprise for you.” And she took her leg calipers off and courageously walked unaided for the first time in her life. So he took them both – but he didn’t pick Wilma to play in a single game that year. She was the only member of the team to suffer the indignity of having a vest with no number on it. But Wilma never accepted defeat and finally, she got a few games. It was then that she was spotted by Ed Temple, who was the coach for the women’s track team at Tennessee State University. He saw straight away that Wilma was built for athletics, not basketball, and he invited her to a summer sports camp. Wilma trained hard and she got better and better. She actually started to win races, first in her club, then in her town, then in her state, and then nationally, even going on to the Olympic Games in Melbourne in 1956 at the age of 16, where she won a bronze medal in the 4×400 relay. 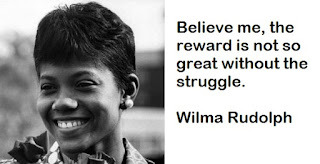 Four years later in 1960, Wilma Rudolph went to the Olympic Games again, this time in Rome, where she took the 100 meter gold, the 200 meter gold, and the 4×400 meter relay gold, breaking three world records. Are you going through a difficult time at the moment. Believe. Work hard. Don't give up.